Explanation: There's something behind these clouds. Those faint graceful arcs, upon inspection, are actually far, far in the distance. They are the Earth's Moon and the planet Venus. Both the Moon and Venus are bright enough to be seen during the day, and both are quite capable of showing a crescent phase. To see Venus, which appears quite small, in a crescent phase requires binoculars or a telescope. 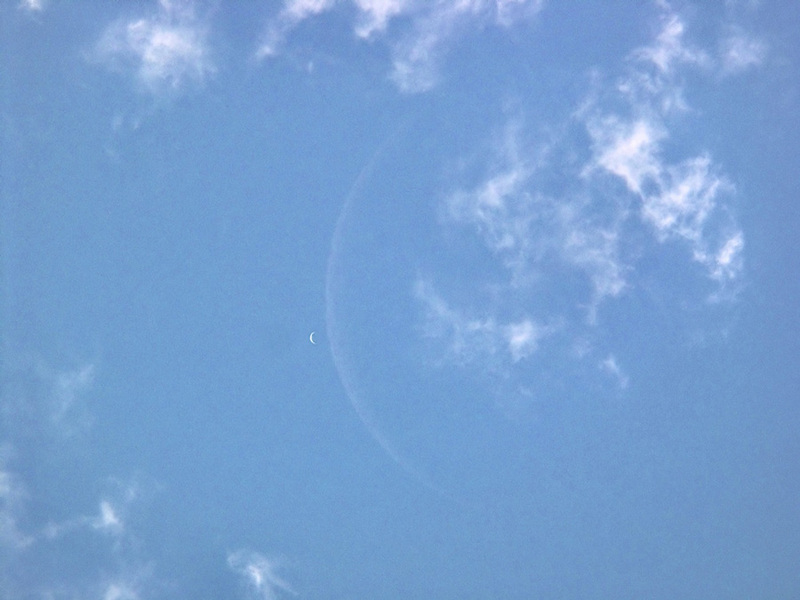 In the above dramatic daytime image taken from Budapest, Hungary in 2004, the Moon and Venus shared a similar crescent phase a few minutes before the Moon eclipsed the larger but more distant world. Similarly, visible today in parts of Africa and Asia, a crescent Moon will again eclipse Venus during the day. About an hour after the above image was taken, Venus reappeared.